There was originally about fifteen pages worth of sad stuff about the orphanarium. Attempting to remember who voiced the orphans. The shot of Leela poking at her eye is not disturbing if you wear contact lenses. 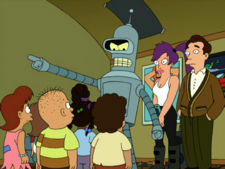 They get away with the episode because despite Bender mistreating the kids, they're always happy. He seems like a fun dad. Matt has never drawn eyebrows on any of his characters, so he finds Adlai's disturbing. Pretty Woman was inserted at the animatic stage and left there because it worked well. Obviously, they did have to pay for it. Agreement that Leela looks better with one eye. Rich Moore, unlike the actors, has a David X. Cohen impression. Mentioned David auditioning for the role of Bender. He hopes they don't have the tape anymore. Adlai's house is modelled off Leave it to Beaver. This episode was nominated for a Media Access Award for positive portrayal of the handicapped. Maurice LaMarche[During intro]: I'm Maurice LaMarche. I'm not sure I acted in this episode, but I'm here. Morbo[episode]: Puny Earthlings, one day my race will destroy you all! Maurice LaMarche: That's totally different from Lrrr, and Horrible Gelatinous Blob.